Emergency dentists work for 24 hours a day and 7 days a week, which is why they’re so important, as you never know when you might need to rush to a dentist. Dental emergencies can occur at any time of the day or night without prior warning, and one has to look into it as soon as possible before it grows into something bigger. Also, sudden dental issues may be a warning for something much bigger lurking under the surface. Emergency dentists are also a blessing to those who have a full-time job during the weekdays, as normal dental clinics are closed during the weekends. Which is why, emergency dentists give those people a chance to visit the dentist on the weekend without needing to take the day off from work. Naperville is a suburb in Illinois and has a population of around 145,000. As it evolved into an affluent city over the years with a growing population, the need of emergency dentists in the city grew along with it. The city is currently the 5th largest in the state of Illinois, which should clearly tell you why the city would require more that just one emergency dentist. Thankfully for Naperville, it contains some extremely reliable emergency dentist to look after the dental needs of the population. If there is a sudden emergency and you don’t know what to do, you can always call 911 in those cases. However, it is still best to know the names and the numbers of a few emergency dentists near your area, as you never know when you might need them. That said, we have compiled a list of a few emergency dentists located in Naperville. 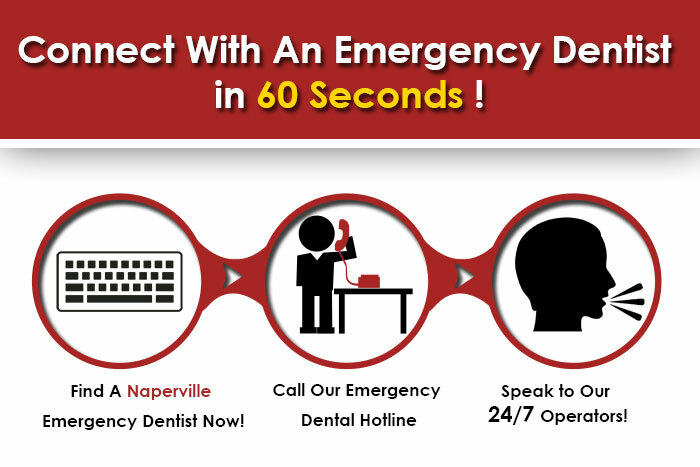 Description Emergency Dentists USA will connect you to an operator who has the ability to find the emergency dentist in Naperville nearest to you and schedule the next available appointment. Call to be connected with the perfect dentist for you. Naperville is a large city and we have the connections to find a dentist to fit your needs, and can get you an appointment immediately. Sometime’s it’s impossible to get through to a dentist office directly if its after hours or evening, please let the operators at Emergency Dentists USA help you today. Easily find Illinois emergency dentists with our service. Address: 1296 Rickert Dr Suite 300, Naperville, IL 60540, EE. UU. Description: They provide a 24-hour emergency service and same day appointments for emergency cases. They offer a whole range of different dental solutions and also offer flexible financial solutions, which ensure that you can get an affordable service. Address: 609 IL-59, Aurora, IL 60504, EE. UU. Address: 1811 Freedom Dr #113, Naperville, IL 60563, EE. UU. Description: Their working hours are longer than an average dental clinic, meaning that a dentist appointment would no longer interfere with your schedule. Located at 1811 Freedom Drive, call them as soon as you experience a dental emergency. Description: This dentistry operates both at Romeoville and Naperville, and they also offer special offers which decreases the prices of some of the dental treatments by a lot! They provide different dental solutions as well, such as whitening, cosmetic contouring, root canal therapy, veneers, etc. If you wish to know more or would like to book an appointment with them. Which emergency dentist do you use in Joliet Illinois?